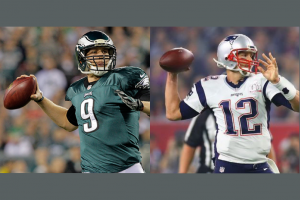 With the Super Bowl fast approaching we’ve all got Tom Brady, Nick Foles and chicken wings on our minds! Although we love football here at Zoe, we also have an affinity for numbers. Which is why we thought it might be interesting to see how the Patriot’s wide receiver Brandin Cooks’ career would stack up against that of an average lawyer. Of course, with all Zoe employees comfortably in their late 20s and early 30s, the dream of being a successful athlete has long run off into the dark abyss of fine lines and a tenacious lower belly… but what the hell! To compare careers, we are going to assess the career potential of both Cooks and the lawyer. This term career potential is equal to the present value of your future salaries i.e. what you’re worth today based on your earning potential going forward (the methodology for this example is outlined at the end of this post). Cooks earned just $750,000 in the 2017 season… pocket change, right? But he got a big pay increase in the 2018 season earning a whopping $8.4 million! 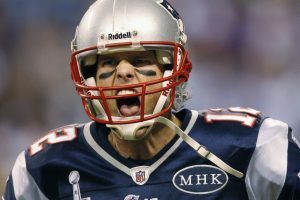 Of course, we all now that the legendary Tom Brady is still playing at the tender age of 40 (gasp!) but for the average NFL player, careers are significantly shorter. We’re assuming that Cooks will retire at age 27, which would be a really long 7-year career v.s. the average wide receiver in the NFL who only has a career lasting 2.9 years. 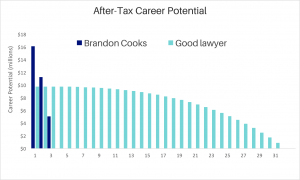 Based on his annual earnings (and remember we are purely talking about on-the-field earnings here for simplicity’s sake) and career length, Cook’s current career potential before tax could be close to $24 million. And after we adjust for tax, it’s more like $16.1 million, as shown in the chart below. Surprisingly though, his career potential is roughly the same as that of a 34-year-old New York-based lawyer who makes $300,000 per year. As you can see in both charts below, a main driver for the similar career potential, despite the glaring annual salary differences, is the duration of the career. Cooks NFL career is much shorter than say yours or mine, but it should be offset to some degree by the higher annual salary. 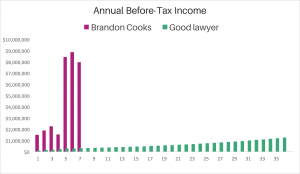 It is worth noting that Cooks NFL annual income will be a lot more volatile than that of a corporate lawyer, which explains why the bars are a lot smoother for the lawyer. 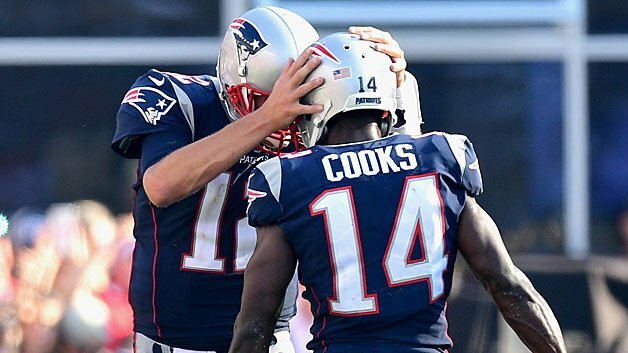 Essentially what we can see is that with each year closer to retirement, Cooks earning potential decreases, as he has fewer years left to earn a salary. When he does eventually retire, his NFL earning potential (again, just on-the-field earnings) will be zero. But if he saved around 25% of his yearly NFL income and doesn’t allow for “lifestyle creep”, he could potentially live off his savings and investments for the rest of his life! At the end of the day, whether you are Brandin Cooks or a slightly overweight lawyer in your 30s, your best income years are still ahead of you! And you have the potential to manage that money in such a way that you can live off of it when the proverbial tap runs dry. 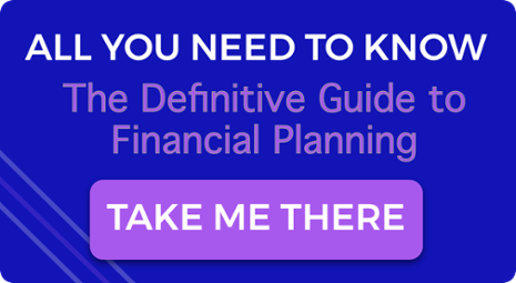 At Zoe we have a plethora of resources, tools, and advice on hand, to help you do just that. If you enjoyed this post, check out Chicken Wings, Pizzas & Beers: Super Bowl LII By The Numbers. To create Cooks chart, we used his current age and made assumptions about his salary growth trajectory. 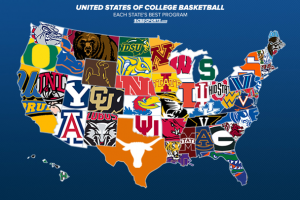 How much is your college basketball team worth?